The 'Tesla Coil' is a device invented by the brilliant scientist Nikola Tesla (born 1856, died1943). It is a high voltage, high frequency, power generator, primarily built for conducting experiments and to observe phenomenon associated with alternating electricity. With this coil, Tesla was able to generate voltages of such magnitude, they would shoot out of the apparatus as bolts of lightning! Although the sight of writhing streamers of electricity jumping though the air is certainly spectacular, to Tesla it represented energy loss. On occasion, Tesla deliberately adjusted his equipment to produce these visible outputs as a means of gauging the state of tune of the system, and to provide some feedback for his experimentations. Today, Tesla Coils are built by amateurs all over the world for one reason only, the thrill of making your very own Lightning! So you want to build a Tesla Coil! Initially, your sole reason for wanting to build a Tesla Coil is to see the fantastic light show they produce. You've surfed the Internet and seen that it's possible for anyone to build a coil, so you're thinking that you want to give it a try. Required skills: Building a coil requires ability in many different areas of engineering. 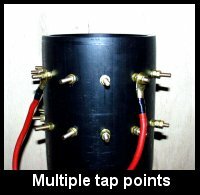 You will need to work with wood, metal, plastics, adhesives/sealants; use hand and power tools for cutting and drilling; work with mains electricity, wiring, soldering; improvise and modify stock items, perform simple mathematical calculations, plan your coil around what components you can find/afford. And finally, the most important requirement of all is Time! Lots of it! Most of what you will now read here will seem dull and far away from the excitment of homemade lightning. You'll probably want to skip it and start building straight away but if you do you will soon find yourself with lots of questions and no answers. You really do need a plan! What size coil are you going to build? 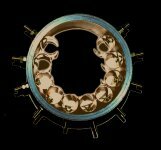 If money is no object, you can get hold of all the components you need for your coil, from anywhere in the world, and build a really powerfull one, but there's a little more to it than that. Do you have the space to power up your coil? Here in the UK, an average sized single garage has sufficient room for a Tesla Coil around the 1kW power level. The output streamers will be cut short by the walls and ceiling but not too much. You may be tempted to build a really big coil and run lt outdoors. It would be much more impressive and more people could watch it at the same time, without having to crowd into a small garage, but be warned! Pictures on a web site do not convey the real impact a coil makes. Tesla Coils are VERY VERY LOUD!!! Don't build a coil capable of 7 foot long sparks and run it in the garden, only to find the neighbours get upset and call the Police! The hardest component to get is the power transformer, and the range of available High Voltage transformers is small. A suitable voltage is from 6kV to 15kV(RMS). The ultimate transformer is a 'Pole Pig' but it is not easy to get one, and there are problems associated with transportation! For the average person, the only possibilities are OBITs (Oil-fired Boiler Ignition Transformers) and NSTs. Check out your local (and national) telephone directory for businesses that deal in oil fired central heating or neon signs. You may have decided on the size of spark you want but the real limit to your output is the transformer you manage to find. It is recommended that you wind the secondary coil with one continuous piece of wire. Small quantities of enameled copper wire are readily available from hobbyist electronic component shops and mail-order firms. Reel sizes vary from 50 grams to 500 grams, which is fine for small coils but you will not have enough to make a medium sized one. You will need to find a local company that will either sell you wire in the quanties you need or who know of a supplier that will (wire tends to come on 20Kg reels!). The recommend type of capacitor for the tank circuit is currently the MMC (multi-mini-cap). It is easy to build, easy to transport, relatively cheap to make and is an excellent performer. The individual capacitors that make up the MMC (and the associated bleed resistors) are available from mail-order electronics companies. All the other material are readily available from local DIY stores. You should start calculating the design parameters based on the power rating of the transformer you are using. Example: If you had an NST rated at 10KVRMS@60mA then the power is V x I = 10000 x 0.060 = 600Watts. The power rating of a coil relates directly to the size of the secondary because as the spark length increases with power, you get damaging strikes to the primary coil unless you make the secondary coil taller. (You can add a strike rail to the primary coil to protect it but if your secondary is just too short for the power rating then all you will get is strike rail hits and few streamers into the air). Use this table as a rough guide to choosing the diameter of your secondary coil form. After lots of experimentation, the modern pioneers of Tesla Coiling have come up with the following rules for determining the optimum size of a secondary coil (see table). This gives you size of coil, so to get the form length add a couple of inches to the coil length. Example: For the 4 to 6 inch coil form range, if you choose 4 inch then the height of the wound coil will be 5 x 4 = 20 inches. Add a couple of inches to the length to get the actual length of plastic tube you need to get. Enameled copper wire comes in a wide range of diameters. You are aiming to have around 800 to 1000 turns of wire for your secondary coil so divide the coil length just worked out by say 900, to get the approximate wire thickness. The values manufacturers quote are for the copper conductor diameter. The enamel insulation usually makes the wire approx 10% thicker so allow for this in your sums. Example: Your chosen coil length is 20 inches, or 508mm. 508 divided by 900 = 0.564mm per wind. wire (conductor) diameter = 0.564mm / 1.1 = 0.51mm. You may not be able to get 0.51mm diameter wire so find the nearest available size and check out how many turns it works out to. 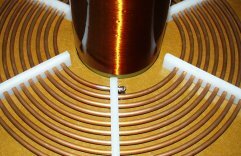 The coil has a characteristic inductance and capacitance which you will need to know. Feed the dimensions of your coil into the 'Helical Coil' calculator (see the 'Equations' section), using the 10% enamel width value for the turn spacing value. with a wind height of 644mm. Now that the dimensions of the secondary coil have been determined you should think about the top load, or discharge terminal. The classic shape is the torus (ring doughnut shape) but anything without sharp corners will work. The obvious alternative is a sphere. The discharge terminal acts as a capacitor and forms part of the secondary LC circuit. Its value is dependant on its shape and size, and can be worked out with the 'Top Load' Calculator. Calculate the capacitance of the top load and together with the calculated inductance (and self-capacitance) of the secondary, you can work out the resonant frequency for the secondary circuit (see below). Example: With a toroid made from 4 inch aluminium ducting and having an overall diameter of 15 inches, we get a value for its capacitance of 16.6 pF. We now have the two parameters needed to calculate the resonant frequency of the secondary circuit, namely the secondary inductance and the combined top-load and secondary capacitance. Use the 'LC Calculator' to work out this frequency. The resulting resonant frequency is 207KHz. For maximum output from your coil the value of the tank capacitor can be calculated to match the transformer you are using. The spark gap fires and transfers energy from the tank cap to the primary coil every half-cycle of the mains supply (e.g. 100 times a second for 50Hz supply). This means that the transformer only has the time in one half-cycle (10mS) to recharge the capacitor for the next firing of the gap. A capacitor that is only charged up to half its capacity in the time allowed is not being used fully, and a small cap which could be charged twice over in the time is missing out on half the power available. A capacitor which is smaller or larger than this value will still work but the power output will be less. Smaller is better than larger because it's cheaper! Use the 'Cap Calculator' to find the matched value of capacitance for your transformer. Example: A 10KV(50Hz) 100mA NST can run at maximum effieiency with a 0.031uF cap. If you decide on building an MMC style cap, use the 'MMC Calculator' to work out the number of individual components you will need. The primary coil and the main tank capacitor form the primary resonant (LC) circuit. For proper operation, a Tesla Coil must have identical primary and secondary resonant frequencies. Using the 'LC Calculator' again, we feed in the value of our primary tank capacitor and then experiment with different values for L until we get a frequency match to the secondary circuit. Example: Using the value of 0.031uF for our primary cap, we will aim to match the resonant frequency of 207KHz (secondary circuit) by trying different values for 'L' in the 'LC Calculator'. With a value of L = 0.03mH we get a res freq of 165KHz, which is too low, and with L = 0.01, F = 286KHz, too high. Having calculated the required inductance, you now need to decide on the actual physical parameters of the primary coil. For a flat spiral coil, which is the prefered choice, you need to know the width and spacing of the conductor, the diameter of the inner turn and the number of turns to be able to find its inductance value. Use the 'Spiral Coil Calculator' to find a match for your target inductance. Example: We are aiming for a value of 0.019mH for our primary coil. The diameter of its inner-most turn needs to be a couple of inches larger than the secondary coil diameter, so for a 6 inch secondary we get a value of 8 inches (1 inch clearance all round). We'll choose to use 8mm (0.315 inch) copper pipe for the conductor, with a gap of 8mm (0.315 inch) between each turn. we get a value of L = 40.413uH (or 0.040413mH). By trying a few different numbers for N, we eventually find that 7 turns gives us a value L = 0.019221mH (19.221uH) which is close enough to our target. To allow for variations in component value and for experimentation, increase the number of primary turns by about 50% (7 turns goes up to about 10). The Spark Gap is the power switch for the primary tank circuit. It uses the air to conduct electricity between its electrodes and generates a great deal of heat in the process. The size of the total gap is dependant on the supply, the higher the voltage the larger the gap that can be used. The gap is usually split into lots of smaller gaps, all wired together in series. This is done for two reasons; 1) The more gaps you have the more power it can handle; 2) It is possible to vary the firing voltage of the gap by changing the number of electrodes that are in circuit (by moving the connecting wires). Individual gap spacing of 20 to 30 thou (thousandth of an inch), 0.5 to 0.75mm, with the total gap being around 6mm for a 10kV supply is roughly the sort of dimensions you need, but it's not critical. If the total gap is too big then the supply will not be able to break down the air and fire the gap properly, and if it is too small then it will still work but at less than optimum performance. The type of material and the size of the electrodes will affect the time the coil can be run before the gap gets too hot and vapourises itself. Copper requires regular cleaning to maintain maximum performance whereas tungsten would not. Cooling can be added to help, in the form of a fan or blower. Vacuum cleaners are a favourite choice for coilers.